Welcome to the art that rocks. 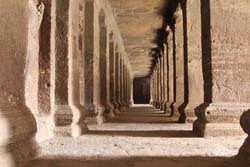 Located about 400 kms from Mumbai, Aurangabad offers to tourist glimpses of fine art & history right from 2 BC to 18 AD. Aurangabad is very well connected by air, rail & road. I drove from Pune, which is about 250 kms from Aurangabad to spend a weekend out there to explore the region. For those not driving, may want to hire a cab locally. This would prove quite cost-effective. 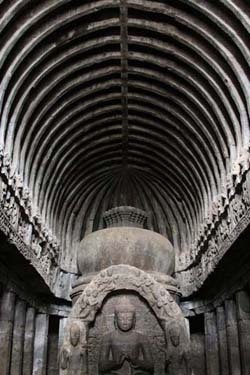 40 kms from Aurangabad are Ellora caves. And just a km. away is the shrine of Grishneshwar which is the 12th and the last one of the 12 jyotirlingas (11 in India and one in Nepal). Do refer to my feature on Bhimashankar that tells you more about Lord Shiva and the sacred locations. After paying respects to the Lord, I headed towards the caves. 34 caves have been numbered so far. 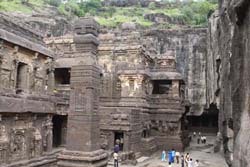 Carved in the Sahyadri mountain range, Ellora has a total of 12, 17 and 4 caves that depict the art of Buddhist, Hindu and Jain faiths respectively. I don't know why thereisn't a cave numbered 33. Now a world heritage site, the location is very well managed by Archeological Survey of India with support from UNESCO and Japan. Entry fee to Indian and foreigners is Rs 10 and Rs 250 respectively. Do note that the caves are closed for viewing on Tuesdays. I also recommend engaging the services of a recognized guide. They charge Rs 600. My Guide was Sandeep Gaikwad who did a good job. He was fluent in German too. Between 22 recognised guides out there, many languages of the world have been well covered. To the purist, these are not caves. They have been created by man by cutting in the rocks with tools that were all of hammer, chisel and pickaxe. Carved in 757 AD, I wonder what instruments the artisans had. It's an architectural and engineering marvel. Awe-inspiring is the cave no 16, named Kailash (believed to be the home of Lord Shiva in the Himalayan mountain range). This huge temple, that resembles a massive chariot, was created by chiseling away rocks from top to the bottom! The ceiling was carved out first. The foundation was the last thing to be made. What was not needed was hammered out. What remained behind were stunningly beautiful, sculptures… of God & Goddesses, of animals, of flowers, of chariots, of towers. In this cave alone, it is estimated that over 200,000 tons of stone was carved out. Kudos to the architect / engineer who managed to create a cantilever that's 80 meters wide, 120 meters long and 30 meters thick! 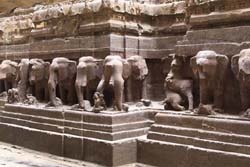 Sadly, most of this fine work of art has been disfigured during the reign of non-Hindu rulers. However, a visitor won't have to imagine much to appreciate the beauty. On an average you would need about 3 hours to go through a handful of caves. I spent more time in cave numbers 16, 10 and 7. They were fine examples of cut rock. I just walked by few other caves. It's a 12 km walk if one actually wants to cover all the caves. Not recommended to the average tourist. A few kms. towards Aurangabad is Khuldabad. Aurangzeb's tomb and the Bhadra Maruti Temple are located in this town. Emperor Aurangzeb was the erstwhile Mogul ruler after whom the city has been named. Despite his statehood, it was Aurengzeb's wish that his tomb be built with the few rupees that he had earned by weaving cloth caps! The Bhadra Maruti Temple is famous because the deity of Lord Hanuman (God with a monkey head, believed to be extremely strong and a die-hard devotee of Lord Rama) is in a sleeping position. Usually, Lord Hanuman's stance is either in sitting, standing or flying postures. A few kms. from Khuldabad is the Daulatabad Fort. It was built in the 12th century by Raja Bhillamraj of the Yadav Dynasty and was then called Deogiri Fort. Deogiri yielded to enemy assault and passed into the possession of the Sultans of Delhi in 1308 AD. Thirty years later, Muhammad Tughlak who ascended the Delhi throne, ordered the Capital to be shifted to Daulatabad - the City of Fortune. Daulatabad Fort stands 600 feet tall. From a general tourist's point of view, however, the steep climb can be avoided. A visit to the entrance gate, the victory minaret, the massive moat with its draw bridge suffices. Once back in town, I moved towards Pan Chakki - A mill that's powered by flowing water. It was built during the Mughal reign in 1624 essentially to grind corn to make bread for the poor and serving the military garrison. The water flows down through clay pipes that connect to a water reservoir 11 kms. away. The engineers were Russian Muslims Hazrat Baba Shah Musafir and his nephew Hazrat Baba Shah Palangpoch. The mill is still functional, albeit no grain is being milled. The tour was enough for the day. I checked in Hotel Taj Residency. This is an excellent property but is situated in a far corner of Aurangabad. Other luxury hotels are on the side of the town near the airport. Like always, I could depend on the Taj hospitality. Decent rooms, over looking the spacious lawns and the pool made for a comfortable stay. Aurangabad has 52 gates (called Darwaza) in different parts of the city. Each gate has a name. I remember crossing Delhi Darwaza, Rangeen Darwaza and Makai Darwaza. I crossed a few more but couldn't gather the names. Some gates are majestic, some are small and some stand broken. The next day, I reserved to do a little pilgrimage. About 500 kms round trip would take me to two more jyotirlingas - Ondha Nagnath and Parli Vaijnath. Having come so near, I thought it prudent to add a day to my trip and seek the blessings of Lord Shiva. I started at 6AM and was back in the hotel at 8PM. Ondha Nagnath is about 200 kms from Aurangabd. From there to Parli Vaijnath is about 150 kms. And about 200 kms brings you back to Aurangabad. This is very popular triangle with devotees, especially in the Hindu month of Shravan (monsoon). And if it's a Monday, expect long queues at all Lord Shiva's shrines. But that's another story. 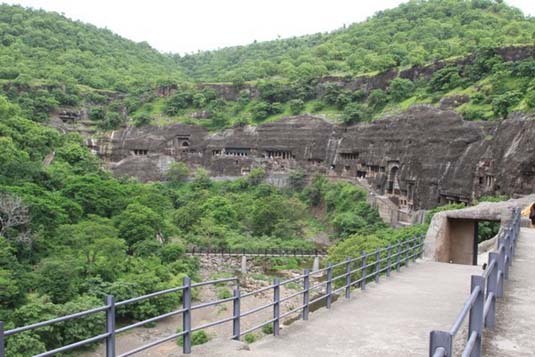 The next morning I started at 7AM to reach Ajanta Caves, about 110 kms from Aurangabad. This is again a world heritage site and is home to 26 caves, cut in rock. Apart from rock art, few caves showcase excellent paintings that are intact even after 1500 years. 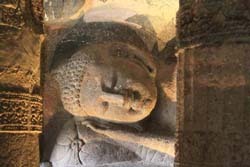 The sculptures in rock and the paintings in all caves entirely depict Buddhist faith. Cave numbers 1, 2, 16 & 17 are popular for paintings. Cave numbers 9, 10, 19, 24 & 26 are popular for sculptures. Cave numbers 9 & 10 are the oldest. Do pay special attention to the wardrobe, hairstyles and the jewelry that adorn the human figures in the paintings. 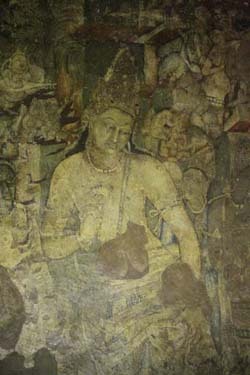 The paintings of Ajanta have been an inspiration to modern day fashion designers. What happened 2000 years ago is still in vogue! This huge work of art was done from the year 2 BC to 7 AD. Many have been left incomplete. It is believed that the work was abandoned when the Buddhist influence began to diminish due to the rise of the Hindu faith post 8th century. The caves were discovered only in 1819 by an English Soldier, John Smith, who was out hunting tigers in the jungles. It took more than 25 years to excavate the caves. Sadly, moisture and other elements faded most of the paintings. Not to forget, the autographs of the many locals who came over after the discovery. Fortunately, the caves are now in safe hands of Archeological Survey of India. Cars need to be parked about 7 kms away. For Rs 7 per head, state run eco-friendly buses drive you to the base of the caves. You need to climb about 350 steps to reach the first cave. It's up and down thereafter as you cross one cave after another. Entrance fees for Indians and foreigners are Rs 10 and Rs 250 respectively. Guide services are recommended who charge Rs 600. My guide was Mohamed. The location is closed on Mondays which please note. From parking lot to the caves and back would need at least 4 hours. More for the history and the art enthusiast. Back in Aurangabad, my last stop was Bibi Ka Maqbara - a monument built in the memory of Rabia-ud-Durrani, wife of Emperor Aurangzeb. 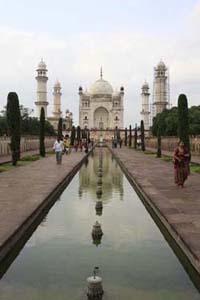 The tomb resembles Taj Mahal, albeit it's no match to the grandeur of the Taj. You may want to refer to my blog on Agra. Records say that Bibi Ka Maqbara was built under the order and direction of Aurangzeb's son Azam Shah. Scholars believe that this cannot be the case as Azam Shah was only 6 years old in 1651 (completed 10 years later and employing 10,000 craftsmen) when the tomb was being made. It is said that the records were created at the behest of Aurangzeb as he was worried that the expenses to build the tomb would anger his subjects especially because Aurangzeb put his father Shah Jahan in jail for having spent a fortune to build the Taj Mahal for his wife Mumtaz (Aurangzeb's mother). Irrespective whether a husband built the tomb for in memory of his wife or a son for the love of his mother, this monument is definitely worth a visit. It would be two hours and Rs 5 (Rs 100 for foreigners) well spent.